In a first, South Korea has developed a hi-tech 'electrified' road which can recharge moving electric vehicles as they drive over it. Project developers claim that the 12 kilometer route is the first of its kind in the world and allows electric public buses to recharge their batteries from buried cables as they travel. The Online Electric Vehicle (OLEV) is an electric vehicle that can be charged while stationary or driving, thus removing the need to stop at a charging station, researchers said. OLEV, developed by the Korea Advanced Institute of Science and Technology (KAIST), does not require panto-graphs to feed power from electric wires strung above the tram route. Two OLEV buses run in an inner city route between Gumi Train Station and Indong district, for a total of 24km roundtrip. The bus receives 20 kHz and 100 kW (136 horsepower) electricity at an 85 per cent maximum power transmission efficiency rate while maintaining a 17cm air gap between the under-body of the vehicle and the road surface. OLEV receives power wirelessly through the application of the Shaped Magnetic Field in Resonance (SMFIR) technology. SMFIR is a new technology that enables electric vehicles to transfer electricity wirelessly from the road surface while moving. Power comes from the electrical cables buried under the surface of the road, creating magnetic fields. There is a receiving device installed on the under-body of the OLEV that converts these fields into electricity. The length of power strips installed under the road is generally 5-15 per cent of the entire road, requiring only a few sections of the road to be rebuilt with the embedded cables. The road has a smart function as well, to distinguish OLEV buses from regular cars - the segment technology is employed to control the power supply by switching on the power strip when OLEV buses pass along, but switching it off for other vehicles, researchers said. 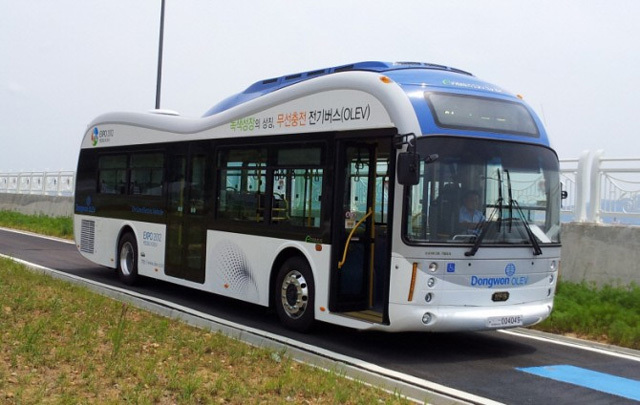 "This is certainly a turning point for OLEV to become more commercialized and widely accepted for mass transportation in our daily living," Dong-Ho Cho, a professor of the electrical engineering at KAIST, said.